Across their range tiger, Asian big cat and otter populations are under increasing threat from the demand for skins and body parts. Since 1999 huge seizures have taken place in India, Nepal and Tibet indicating that there is a sophisticated network of criminal masterminds controlling the trade in urban and cross-border areas. The volume of skins and body parts confiscated in most of these cases suggest that dealers are confident of avoiding detection and taking greater risks. However, it is likely that the vast majority of consignments reach their destination undeteced: Tibet's capital Lhasa, from where the growing market in Tibet, mainland China, Hongkong and Taiwan is supplied. For years, political commitment to combat wildlife crime and implement adequate enforcement measures remained a low priority in all range countries. Only since 2006 several wildlife traders have been arrested and sentenced in India and Nepal. In May 2011, an Arabian Leopard was captured in Yemen's Lawdar District and tormented by the poachers who also posted a video at YouTube. The Director General (DG) of Lawdar District identified and contacted some of the men who could be seen in the video. He learned that the Leopard was sold to an unknown buyer for YR 700,000 (about US$ 3,000), but allegedly died shortly afterwards. The video was removed in November 2011. Whether the poachers were charged and convicted, remains unknown. On 13 May 2011, the Bangkok based FREELAND Foundation reported the arrest of a United Arab Emirates citizen as he was preparing to fly first class from Bangkok to Dubai with various rare and endangered animals in his suitcases, which included four Leopard cubs, one Asiatic black bear cub, and two macaque monkeys. For more information also read this article. On 16 September 2010, the Wildlife Protection Society of India reported 133 Leopards killed in 2010 in India. In May, the NGO estimated that at least 3,189 Leopards were killed in the country since 1994. For every tiger skin, at least seven Leopard skins are smuggled. On 25 January 2010, two skins of fully grown Leopards were seized in Himachal Pradesh, India. A 55-year-old man was arrested for allegedly possessing these skins, reported Wildlife Watch India. Between April to December 2007 ten Leopard skins, two tiger skins, tiger bones, 350 pieces of tiger whiskers, 1 clouded Leopard skin, 1 Leopard cat skin, 500 elephant hairs and baby rhino horn were seized in various districts in Nepal. 13 traders and poachers have been arrested. In the last week of January 2008 the wildlife trader Tsewang was sentenced for 15 years imprisonment along with a fine of Nepali Rs. 100,000 (about 1335 US$ / 930 €). Tsewang had been in the wanted list of the Government of India since 1994; Nepal Police had arrested him on 11 December 2005. A Tibetan-Nepali national identified Tshering Lama, a "notorious" international poacher and trader of illegal wildlife items, was arrested in New Delhi on Friday evening, February 3. Police also seized a huge cache of 34 freshly-tanned Leopard skins and four otter skins from Lama, a Tibetan national based in Nepal. A massive manhunt is on to nab two of his accomplices who are believed to be hiding in the area. According to sources, the absconding criminals are in possession of more banned wildlife items, including tiger skins. The Leopard skins bore marks resembling a signature with a mixture of Tibetan and Chinese characters. The consignment was en route to Siliguri in West Bengal, to be then dispatched to the Tibetan Autonomous Region through Nepal. During a 4-week fact-finding mission to Tibet and China in August the investigators obtained video and photograph footage documenting a massive increase in the availability of tiger, Leopard and snow Leopard skins in the country. They attended several horse festivals and found many people, including organizers and officials, wearing costumes decorated with tiger and Leopard skins. 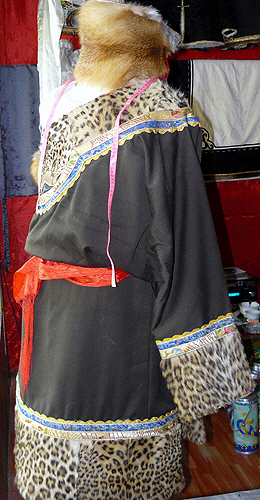 In Lhasa they found 54 Leopard skin costumes, and 24 tiger skin costumes openly displayed. Seven whole fresh Leopard skins were presented for sale and, within the space of 24 hours, they were offered three whole, fresh tiger skins. In one street alone in Linxia, China, more than 60 whole snow Leopard and over 160 fresh Leopard skins were openly on display - with many more skins rolled up in the back. They also found over 1800 otter skins used for decorating traditional costumes. EIA and WPSI are appealing to the Tibetan people to stop wearing endangered tiger and Leopard skins, and urge international organizations to support awareness initiatives to get the message to consumers as fast as possible. On 2 September, the Royal Nepal Army seized five tiger skins, 36 Leopard skins, 238 otter skins and 113 kilograms of tiger and Leopard bones in the Rasuwa district of Nepal, bordering the Tibetan Autonomous Region. This consignment was found during a routine patrol in the village of Syabru Besi close to the Langtang National Park hidden beneath perishable goods. The person carrying the consignment, Mingmar Tshering Tamang, is under police custody along with two of his accomplices, both from Nepal. According to an official the goods were coming from Delhi and supposed to be sent to Tibet. Indian police in Delhi last night seized 44 fresh Leopard and 14 otter skins. A team led by Assistant Commissioner of Police Mr. Bhagat arrested two Tibetans and one Nepali in connection with the seizure, which took place on the very day that His Holiness the Dalai Lama launched a collaborative initiative with UK Charity Care for the Wild International and the Wildlife Trust of India to stop Tibetan involvement in illegal wildlife trade. The three men were trying to smuggle the skins into Nepal and China, when they were arrested. Their plan was to transport the contraband skins by using an overnight bus service which links the Tibetan settlement Majnu Ka Tila in India directly with Boudha in Kathmandu in Nepal. The men are due to appear in court today. There have been further seizures of tiger and Leopard skins in Nepal with four separate incidents in 2004 alone. In March 2004, 15 km from the border with Tibet, seven Leopard skins, six otter skins, 165 pieces of Leopard and tiger bone and 185 pieces of rhino skin were recovered by the army from a container truck. In April 2004, six Leopard skins were seized from a Mr. Jampa Lama in Nepalganj on the border between India and Nepal. Nepalese officials working undercover arrested the buyers of the skins at their workshop in Boudha in the centre of Kathmandu, where skin sections equivalent to 24 Leopards and 12 otters were seized. In July in the Boudha area of Kathmandu, a 24-year-old man was arrested with two tiger skins, eight Leopard skins, four sacks of fresh tiger bones, and a sack of rhino bones and skins. Read more : The Tiger Skin Trail . Between 21 June and 10 July 2004, 10 tiger skins, 25 Leopard skins, four sacks of fresh tiger bones, and the claws of 31 tigers and Leopards were seized in 11 cases throughout India and Nepal. On 9 October 2003 a haul of 1276 skins comprising of 32 tigers, 579 Leopards and 665 otters was intercepted in Tibet as smugglers carried the contraband in a truck from neighbouring Nepal into Tibet. Three Tibetans and two Nepalis have been arrested. The skins are valued at 6.52 million yuan, or 787,620 US$. According to the Vice Director of the Anti-Smuggling Bureau of Lhasa Customs this was the largest such seizure since 1951; many of the skins had bullet holes, and the size of some specimens suggest the animals were only a few months old. The wildlife trade monitoring network TRAFFIC specifies this seizure having consisted of 1392 skins, namely of 31 tigers, 581 Leopards, 778 otters and two lynxes. In the first months of 2003 at least 98 Leopards were poached in India. Informants claim that Leopard poaching and the skin trade is being coordinated on a national scale. On 4 April skins of 109 Leopards and 14 otters were seized in the Kathmandu Valley. The skins were discovered in a truck heading to Dhading Besi (situated west of Kathmandu), packed in sacks and paper bags. Most of the skins smelled badly and were obviously quite fresh; they showed bullet holes or signs of poisoning. On the back they were marked "Paid". This is the largest seizure ever made in Nepal. The trader Pasang T. Lama had 50,000 Rupees (about 640 US$) about him, has been arrested and investigated. He admitted having received the money as advance payment for delivering the skins to the Tibetan border. Government officials assume that the skins were meant to be taken to China via Tibet. So far nothing is known about the whereabouts of the bones and claws of these animals. The Kathmandu Valley is a continuing hotspot of the illegal fur-trade. There, Bodhnath, Thamel and Swayambhunath are known collection centers for skins, bones and other derivatives of tigers and Leopards in particular. Evidence suggests that there are linkages between these illegal markets and the Chitwan area in the south of Nepal, where some tourist guides serve as middlemen between traders and poachers. On 19 December 1999 a truck was intercepted in Ghaziabad, India, containing 50 Leopard skins, 3 tiger skins and 9 skins of other animals - the second largest seizure of big cat skins since India's Independence. All the skins bore the signature of Tashi Tshering, a Tibetan in exile, signifying that these were chosen from a much larger selection. This seizure was followed by a seizure in Khaga, India on 12 January 2000. Four tiger skins, 132 tiger claws, 70 Leopard skins, 18,020 Leopard claws and 221 skins of blackbuck Antilope cervicapra were confiscated. Again, the signatures of Tashi Tshering were present. By then, a new pattern in illegal wildlife trade had begun to emerge: On 19 April 2002 22 Leopard skins and 72 other skins were seized at Siliguri, West Bengal. In January 2003 Tashi Tshering was arrested by the special task force of Uttar Pradesh, India along with 12 Leopard skins.